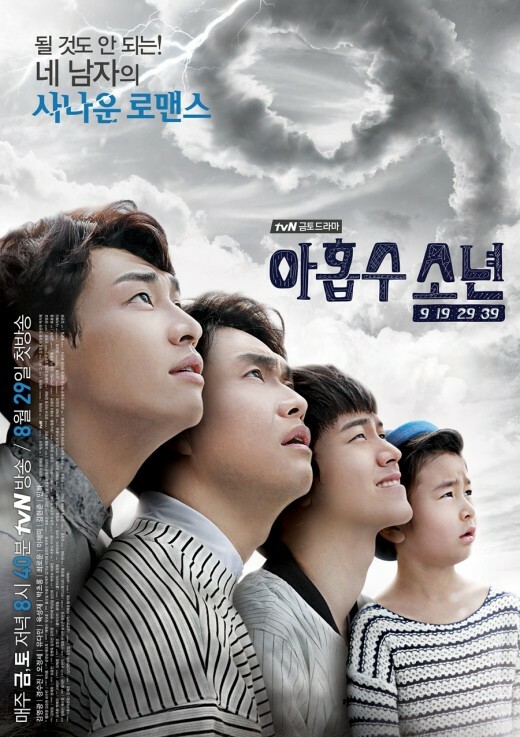 So this past Friday and Saturday, tvN’s new drama ‘Plus Nine Boys’ starring model and actor Kim Young Kwang, Yook Sungjae (of idol boy group BTOB), Oh Jung Se, and cutie child actor Choi Ro-woon (from Good Doctor) aired its first two episodes and I got the chance to watch the two episodes so I’ll be starting a ‘Discuss Away!’ thread for the drama every Friday and Saturday now (since that’s when the episodes air). I’m afraid to say that after watching the first two episodes, ‘Plus Nine Boys’ is not addicting enough for me to want to recap it so the most I can do is open up a ‘Discuss Away!’ thread for it and discuss the episodes and drama with everyone else that is also watching it. But don’t worry! Even though I might not want to recap this drama, I will continue to watch it since I am curious as to how everything’s going to end and turn out. ‘Plus Nine Boys’ follows the lives of three brothers and their uncle, Kang Jin-goo (Kim Young Kwang), Koo Gwang-soo (Oh Jung Se), Kang Min-goo (Yook Sung-jae), and Kang Dong-goo (Choi Ro-woon), “who each confront different challenges in love and work at the cusp of a new decade in their lives.” So they’re all basically cursed since there’s this superstition that at any age that ends with the number nine, you will face some kind of difficulty or obstacle and so since all four guys are at an age that ends with the number nine (9, 19, 29, 39), they are all cursed somehow. I guess we can start this thread off by discussing about episode one first. I actually really enjoyed episode one, mainly because it did an awesome job in setting up and introducing the characters to us. We all know how cutie Dong-goo feels and thinks about himself compared to other child actors or how sincere and genuine Jin-goo feels towards his crush, Ma Se Young (Kyung Soo-jin). It was just great getting to know the three brothers and one uncle and what their curses were since their age all ended with the number ‘nine.’ I love how different the guys are compared to what their mom and sister thinks about them. When she was talking to the fortune teller in the beginning of the drama, she thought that Jin-goo would never be a player because he’s so busy concentrating on his work but then in the next scene you see him partying with girls. LOL. Or how Mom states that Min-goo is behaving well because he wants to get into a university but then in the next scene you see him getting all angry with another guy over some games. Hahaha. I just love the contrast between what Mom thinks of her kids and what her kids actually are like. It provides such great comic relief and really set the tone right when the drama began. It’s so great. I wasn’t all into the teaser promotions that this show was doing before it aired its first two episodes because I don’t really care about those kind of things, but I was excited to hear that Choi Ro-woon who is the cutie that played the younger version of Joo Won in ‘Good Doctor’ was going to be in this drama, because I absolutely adore him. Little kid is so cute and talented at such a very very young age. I can imagine him turning out to be like Yoo Seung Ho, starting acting at a young age and then growing up to become a great and popular actor. I mean, he’s already wooing girls here and there at such a young age – just imagine what he can do when he gets older. LOL. Ro-woon plays a cocky character in this drama which sometimes get on my nerves honestly, but then again I enjoy how he’s always constantly bragging about how he’s a celebrity because he acted in a movie before and how he’s always wearing his shades. It’s the cutest thing ever. I hope that by the end of the drama he will pass an audition and get the role that he wants…but only by getting rid of that arrogant mindset and attitude of his and learning to become humble and working hard to get that role. If I had to choose which curse was the most funniest, it definitely would be Min-goo’s. LOL. Poor boy suffered so much during his judo match. DAMN YOU DIARRHEA. You ruin everything. Haha. I could not stop laughing while watching him struggle and try NOT to poop in his pants during the match. I especially loved it when his opponent was on top of him and Min-goo was trying to communicate to him that he was going to poop any second, but his opponent just pushed down even harder on him. Hahaha, omg, that was epic. I definitely enjoyed Min-goo’s curse the most (why do I feel so bad for saying that?). As for Uncle Gwang-soo’s curse, his was pretty funny and hilarious as well, but still not as funny as Min-goo’s. It was rather weird and awful and awkward and bizarre and strange, but somehow funny. He’s definitely learned his lesson to not invite those guys to perform on ‘Music Camp’ again. And oh yeah! Forgot to mention that talented soloist Heo Gak acted as an MC for the program and I was so happy to see him again since it’s been a while since we’ve last seen him (and I miss him dearly). I don’t have much to say about Gwang-soo’s curse as his story is the one I’m the least interested and invested in, but I’m still going to enjoy watching him try to put everything that fell apart back together. And last but not least, the last curse we were introduced to was none other than Jin-goo’s whose I personally felt like was the saddest and most heart-breaking one. I mean, all the guys suffered just as much as Jin-goo (and probably even worse), but his was just so hard to watch and accept. The drama showed us the other curses first so that by the end of the drama we were fooled into thinking that maybe Jin-goo didn’t have a curse and was going to be curse-free, but it managed to surprise us at the very last minute by doing something totally unexpected and of course, heart-breaking. UGH. I have to admit, many of the things Jin-goo did to his crush Se-young got my heart pounding and the butterflies in my stomach flying like crazy, such as how he placed his arms around her to give her a warm embrace or even just the times he would interact with her. They were so cute and sincere that I couldn’t help but blush myself. I mean if I was Se-young in those situations, I definitely would fall for Jin-goo. In episode one, it’s clear to us that she doesn’t think of him as anything more than just a friend while we are informed of how Jin-goo feels about Se-young which is that he has a one-sided love towards her (which I think is the cutest thing because Se-young always accuses Jin-goo of being a player but yet this so-called player is trying to win only one woman’s heart and it’s hers. Hehe. The irony!). I sometimes felt like she would purposely throw shade at him and talk harshly to him as a way to hide her true feelings and emotions which is probably that she also likes Jin-goo and feels the same way about him (because admit it, us girls like to play hard to get sometimes, especially if it comes to a guy who is popular with ladies. Lol). Jin-goo’s curse at this point is watching his two friends fall in love with each other and that’s the worst thing that can ever happen to him. I never expected the love line between Jae Bum and Se Young and to be honest, it kind of just ruined everything for me. That’s just gotta be the worst. I had wished that the drama had continued to portray Se Young as Jin-goo’s good single friend who he tries to woo and love because Jae Bum and Jin-goo are both really good friends and they’re in love with the same girl and so it’s just like you don’t want them to ruin their friendship over a girl. That kind of thing. Lol. I don’t know. But I definitely felt Jin-goo’s heart-break, heartache, and pain once he saw his crush kissing someone that was not him. Oh Jin-goo, it’s okay. Come here. I’ll heal your heartache for you. Just like how I am a fan of Choi Ro-woon, I’m also a fan of Kim Young Kwang who I have always perceived as this handsome, innocent, and humble guy so it’s hard to see and accept him playing a “player” in this drama, because his face just doesn’t equal that. I mean, he’s good-looking so no doubt he’s popular with the ladies, but I just feel like he’s not the player type so I’m glad that the drama didn’t continue with the characteristic where he’s a player and instead replace that with the idea that he’s loyal and only has eyes for one woman because now THAT is the type of person I can see him being and doing. Lol, OTL. I hope everything I just said right now made some sense. Haha. Episode one ended on a pretty bad note for all of our four main guys, but thankfully in episode two, they slowly find their own ways to recovery. Episode two slowed down a bit for us and focused more on the aftermath of each curse. Mom ends up making Dong-goo attend an acting academy where he reunites with his lovely and adorable girlfriend Baek-ji (Lee Chae-mi) while Min-goo learns to accept that he’s eliminated from the semi-finals of the judo competition but that doesn’t entirely means that his luck has run out as he continues to encounter a beautiful young lady (played by A Pink’s Park Chorong). Uncle Kwangsoo takes some time off as PD of ‘Music Camp’ to work on another variety program ‘Sponge’ and also gains some insight on his future, specifically on his love life where he is told that he will reunite with a past love. As for Jin-goo, poor boy can’t help but study his two best friends and watch their every move, constantly focusing in on them and believing that the two are a thing since they’re always together at work. I didn’t find episode two as intriguing as episode one which is quite sad for me because if episode two had been just as good as episode one or possibly even better, I would have decided to recap this series since I could find myself committed to that task, but episode two was a let down from all the goodness that episode one was. That’s not to say that episode two was a bad episode because it wasn’t. 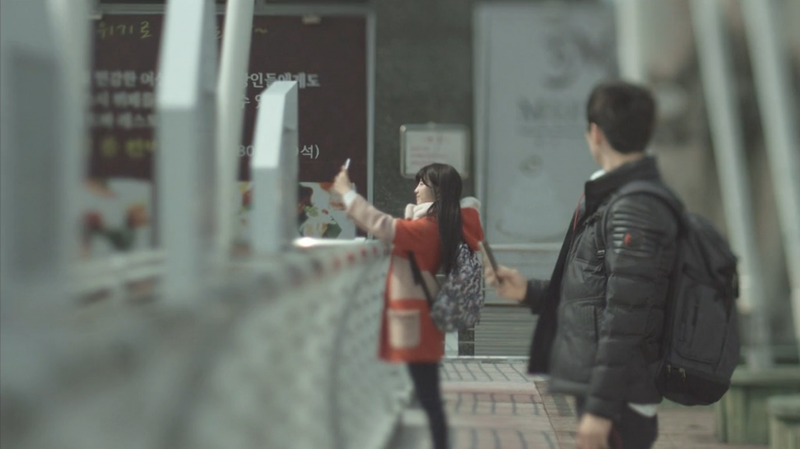 It had its good moments here and there, such as Se-young surprising Jin-goo at work with some chicken or Dong-goo holding hands with his girlfriend who’s just as cute as he is, but then again, I couldn’t find myself wanting for more when episode two ended. There’s not a lot that I remember from episode two so episode one was more memorable for me in many ways. It just felt kind of slow watching episode two and there were times when I wanted it to pick up. I was relieved when Jae Bum told Jin-goo that Se-young had rejected him and told him to wait, because then that just means that there’s a chance that she actually likes Jin-goo which is great because I’m rooting for Jin-goo to get Se-young. You can tell that Jin-goo’s so sincere and genuine about the way he feels towards her (I’m pretty sure Jae-bum is too but we’ve only gotten to see Jin-goo’s actions towards Se-young so far so I’m going based off of that) so I really want him to get her (which will probably happen in the end since you know, Jin-goo is the main character in this drama). The most exciting and funnest part though is going to watch Jin-goo’s attempts to capture Se-young’s heart and interest (if he hasn’t already) and her tries to not fall for him but eventually doing so (with some denial at first of course) because she can’t reject someone as cute and hard-working as Jin-goo. Just thinking about it makes me so happy and excited! I’m enjoying ‘Plus Nine Boys’ so far, but there’s a major thing that irks me which is the music. It’s not the song itself that annoys me, but rather the timing that they are placed in. Too many times throughout the show did I hear songs continue to play in unnecessary scenes or during an unnecessary time that just did not fit in and that really frustrated me because it was so obvious that it was just put in so randomly and did not match the mood or atmosphere of the scene. The thing that amazes me though about the songs are that they sound like different songs every time so I’m expecting quite a few OST tracks for this drama (unless they are songs that already exist but are just chosen to play in this drama). Anyways, if there’s anything that I wish the show would improve and change upon, it would be the timing of the music. Sometimes the music and OST tracks is a huge factor that determines whether a show makes it or breaks it for me. Like for example, I enjoyed ‘King of High School Life Conduct’ A LOT A LOT not only because the cast was great and the plot was interesting, but also because the music was so good and they were played at the right moments and scenes which contributed into making the episode overall even better and more touching. Here, I don’t get the same emotions or vibe that I feel the scene or episode is trying to create. If we see Uncle Kwangsoo visiting three different locations and places, I don’t want a separate song for each visit because it’s not necessary and it just doesn’t belong. Lol. Ugh, I’m going quite crazy over this, but this might just be me and I might be the only one that’s noticing this. Does anyone else feel the same way about this? Did anyone even notice this in the first place? Or was it just me? Another thing that I cannot help but think about (and I KNOW I’M THE ONLY ONE WHO THINKS ABOUT THIS BECAUSE NO ONE ELSE WOULD BE COMPLAINING ABOUT THE CASTING ROLES) is how A Pink’s Chorong is playing BTOB’s Sungjae’s love interest and this thought enlightens me because I can’t help but feel like it’s more of like a sister-brother relationship than a romance relationship because she’s from A CUBE and Sungjae is from CUBE and A CUBE is CUBE’s sister company so it’s like, they’re technically from the same company and it’s weird to see them together as a couple. It’s like DBSK’s Changmin and Lee Yeon Hee who are both from SM or DBSK’s Yunho and Go Ara who are also from SM Entertainment. I just wished that they had casted another idol to play Sungjae’s love interest so I wouldn’t be bothered thinking about how Chorong seems more like Sungjae’s sister than girlfriend. But anyways! Moving on! Overall, ‘Plus Nine Boys’ is off to a solid start and I’m anticipating to see how each guy handles their curse and if they’re going to do anything to get rid of it. ‘Plus Nine Boys’, don’t disappoint me now okay?